We got off to a late start this morning after a breakfast of boiled eggs and biscuits. Our plan was to visit Ernst Tinaja for some more photos and then hike Lost Mine and attend the evening lecture at Rio Village Amphitheatre. Grand plans they were! Ernst Tinaja is about five miles from the southern entrance of Old Ore Road and we rode the little Yamaha motorcycle up from the entrance. I walked up some of the more gravelly and vertically challenging parts and at one point got off and walked a bit–my seat being rather sore after being bounced around. The canyon walk was pleasant being quite shaded. We tried to repeat a photo from previous years with my reflection in the tinaja but this time including me so it didnt’ just look like an upside down photo. 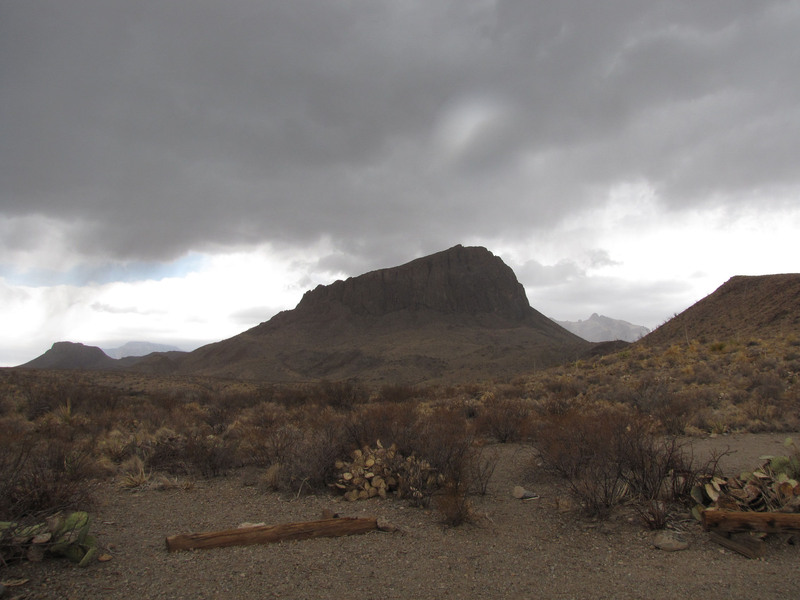 This expedition took much longer than we planned and so decided to spend some time in Chisos Basin where Glen checked his stocks on the internet and I provided an easy target for biting black flies. I walked around the small loop walk, admired the window and learned the names of the mountains, perused the store and found some cute little socks for the grandsons–labeled ‘for bear feet’ with Big Bend Black Bears on them. We ate an early supper at the lodge, Portobello Salad followed by Texas sized mugs of coffee and a shared peach cobbler topped with cinnamon flavored ice cream. The lecture on vultures was quite interesting although we drove all around the campground trying to find the amphitheatre. On the way back, we got stopped by Border Patrol worried we might be transporting illegals in the bed of my truck. I was happy they didn’t ask to inspect all the of the truck contents looking for those wirewound scorpions and road runners and walking sticks. I did have the pictures of them in my camera–but the agent was pleasant and was happy just to see valid drivers license and insurance. Stars were out by the time we got back to our cabin. Only two days left—-and already I am feeling sad about leaving.